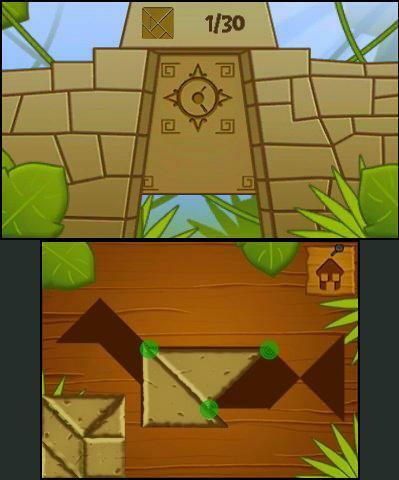 Tons of levels to play, and a very well done child mode. It is all tangrams, all the time - not much in the way of variety. If you’re into tangrams, or just plain love you some shapes, Tangram Style offers a challenging diversion that doesn’t have a lot of bells and whistles, but certainly offers a workout for your mind. With over a hundred puzzles to choose from, you’ll get a lot of play from your download – and additional modes offer even more challenge to determined players. 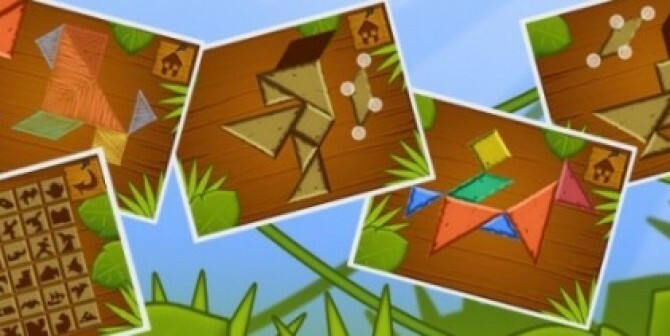 The addition of a very accessible child mode means even the youngest of players can hop aboard the tangram train. It’s time for some tangrams! Oh, tangrams. They aren’t something you see a lot of really, but they can be an interesting and challenging way to pass the time, if done correctly. The concept, for those unfamiliar with it, is somewhat like a jigsaw puzzle without the interlocking edges to guide you. Each tangram consists of a shape – some odd, some recognizable – and a variety of pieces of varied size and shape. The object of the game is to fit all of the pieces into your shape. It sounds easy at first, but you cannot overlap any of the pieces, the entire outer shape must be filled, and you must use all of the pieces. Since each piece can also be rotated and inverted, figuring out the correct combination can be a difficult task. What results is an oddly compelling game that is as challenging as it is low tech. As you begin Tangram Style, you are taken to a menu screen with a fun jungle them, where you can choose from four different modes – Classic, Child, Challenge, and One Touch. Each of these offers the same tangram game play, but in slightly different ways. Classic mode offers your standard gameplay. Each page contains a grid of 36 tiles that represent the tangram puzzles available to you. You don’t need to play in any particular order – choose any tangram you like, and break the tile by completing the puzzle. The game doesn’t have any tutorial at all, other than to tell you how to rotate and invert the pieces. They can be spun completely around and moved into place with your stylus, so getting the pieces in exactly the right place can be a chore. Challenge Mode is just what it sounds like – you are given a goal, such as completing a certain number of puzzles before time runs out. One Touch mode is even more challenging – once you touch a piece, you must place it where you want it go before touching another piece, because it will cement into place and cannot be moved again. These are a bit of a diversion from the Classic play, but don’t have a lot to offer other than a higher difficulty level. As a parent, I really appreciated child more, particularly in a game like this. 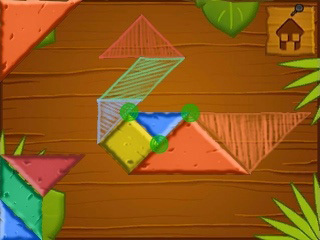 An argument can be logically made for tangrams being an educational pursuit, as children learn a variety of shapes and how they can be placed together to create new ones. Tangram Style actually use the exact same pieces for tons of puzzles in the game, so that concept is really reinforced when kids see how many combinations can be made from a single set of pieces. 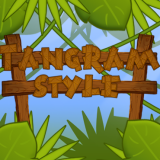 What Tangram Style does with Child Mode is to make tangrams completely accessible, even for very young children. Like a beginner jigsaw puzzle, kids are given tangrams that are marked with the proper placement. The tangrams look just like the ones the adult mode uses, but the pieces are colored, and the shape shows where they should go. This really helps them grasp the concept of what to do quickly, and once they figure it out, they can move on to classic mode for a greater challenge. 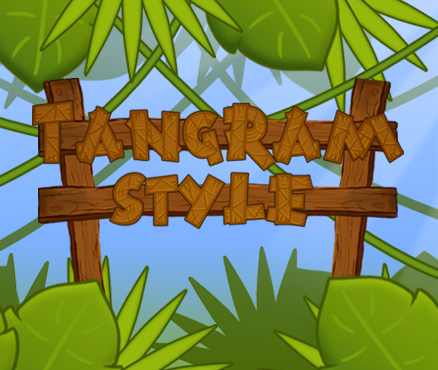 If you’re into tangrams, or just plain love you some shapes, Tangram Style offers a challenging diversion that doesn’t have a lot of bells and whistles, but certainly offers a workout for your mind. 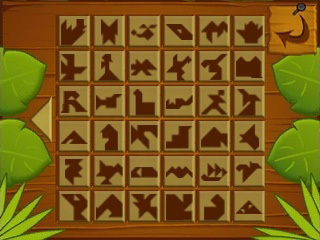 With tons of puzzles to choose from, you’ll get a lot of play from your download – and additional modes offer even more challenge to determined players. The addition of a very accessible child mode means even the youngest of players can hop aboard the tangram train.